Remember pop-up books? I loved them as a kid. You’d be reading along, then you turn the page, and SURPRISE! – a fantastic 3-D illustration of a scene would spring up. That’s what it felt like to be sitting in the balcony car at the end of the passenger train as we click-clacked our way through South Africa’s Great Karoo, sipping chilled cocktails. But I wasn’t in a children’s storybook; my pop-up was straight out of an Agatha Christie novel. All that was missing was a chalk body outline on the floor and Inspector Hercule Poirot. 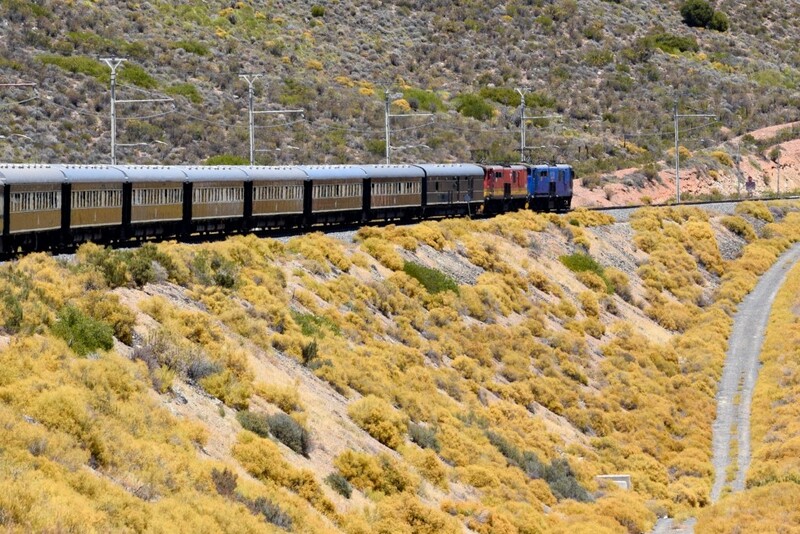 Taking a journey on Rovos Rail is an immersion experience in a by-gone era and is worthy of a spot on your bucket list. The train is meticulously maintained and well-appointed, the service is spot on, and, if you’re as fortunate as me, you’ll have delightful traveling companions. If there’s anything better than snuggling into a nest of pillows with a mellow wine buzz at 2 in the afternoon to watch an exotic landscape roll by, you’ll have to let me know. During the journey, the landscape changes from desert, to lush vineyards, and passes a lake that’s home to over 20,000 flamingoes. Guests who begin their journey at the company station in Pretoria are welcomed by uniformed porters, an ostentation of peacocks, and the founder, Rohan Vos. He purchased his first rail cars at surplus auctions with the intention of restoring them for use as family vacation transport. 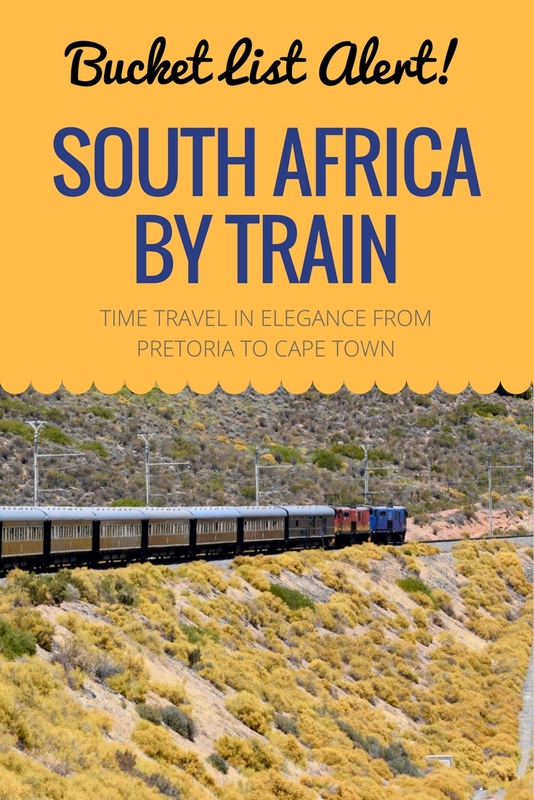 During negotiations with the South African government to use the national rail lines, Vos developed the idea of running a scheduled, vintage train service and he transported his first paying passengers in 1989. After swapping your luggage for champagne flutes, you can relax in the station lounge and enjoy some tea sandwiches, and browse through books about Africa. I used the opportunity to scout out my train buddies and immediately latched onto Ian and Sheila, a lovely couple from Yorkshire. Since the train carries about 35-40 passengers, your companions can make or break your trip. I was very glad that the train wasn’t filled with loud Americans. Instead, I was fortunate to travel with an assembly of folks from Denmark, Great Britain, and South Africa. All were enthusiastic, laid back travelers who were as excited as I was to be onboard. 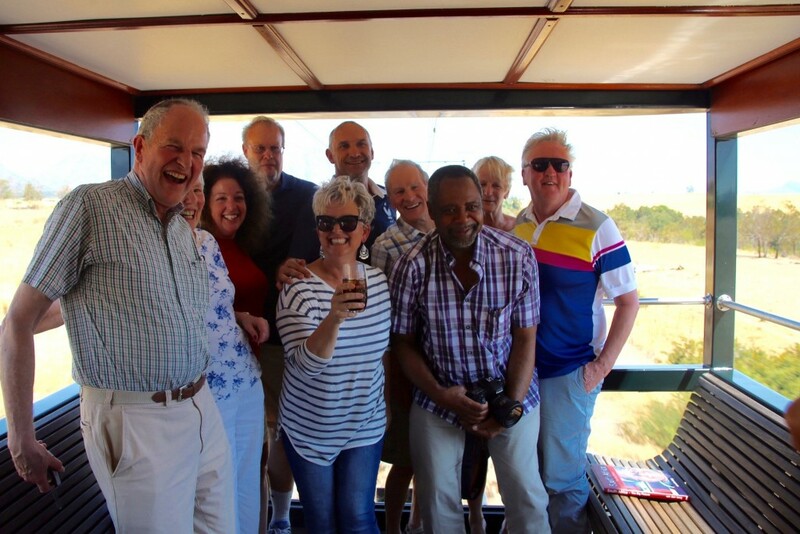 A group of us spent a good part of the trip camped out in the balcony car at the end of the train, draining G&Ts, and swapping stories. I was escorted onboard by Victoria, my cabin attendant, and shown the features of my Deluxe Suite, the mid-range choice of available cabin accommodations. It featured the equivalent of a U.S. king-sized bed, a small table and closet, and bath with a shower. I unpacked what I needed for the trip and then stowed my bags in the overhead luggage rack, so the room didn’t feel crowded. 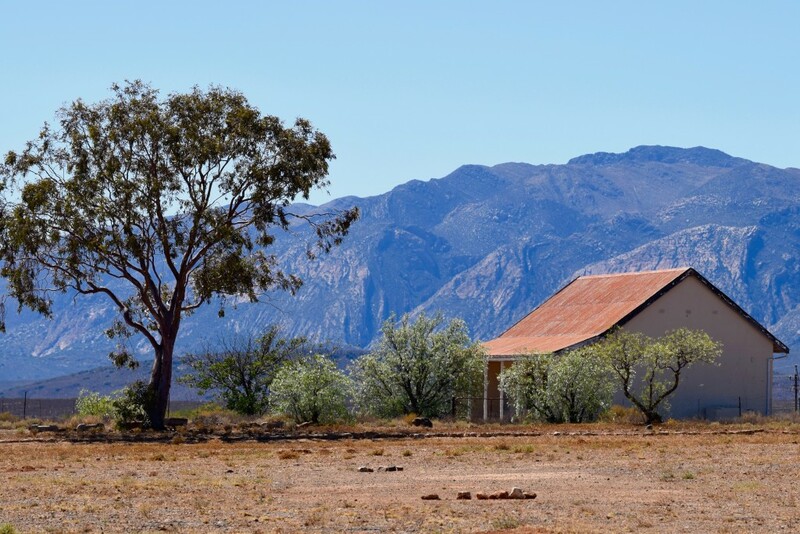 Victoria helped me settle in, stocked the fridge with desired bevvies, and showed me how to work the air con, a modern necessity considering the Karoo’s sweltering temperatures. A nice touch was the inclusion of sunscreen with the usual toiletry items – I’d forgotten to purchase some before boarding and was worried about the damage the searing African sun would do to my fair Irish skin. Additional cabin layouts include a Pullman with bunk beds that convert to a couch during the day and the decidedly decadent Royal Suite that has a freestanding tub. 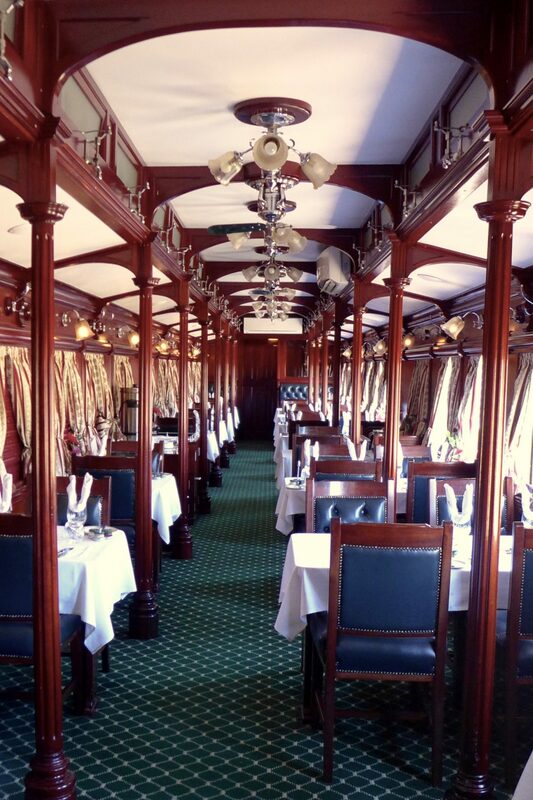 Journeys on Rovos are all-inclusive and meals are served in one of two dining cars. Breakfasts are casual with cold, self-serve items such as muesli, yogurt, fruit, and cheese and hot dishes cooked to order. Lunch and dinner are announced with the banging of a gong; I started salivating at the first note. 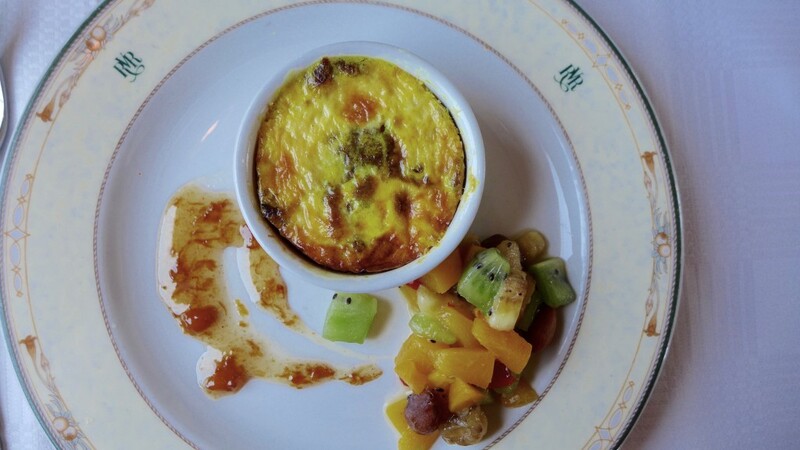 Both meals featured 4-courses – appetizer, main, cheese, and dessert – with wine pairings and introduced us to South African specialties such as bobotie, traditional sweets like koeksister, and the country’s signature wine, Pinotage. The service was leisurely and attentive. Dinners were hushed and intimate, but lunches were more convivial; you felt comfortable in the light of day striking up lively cross table conversations about “Judge Judy”. Europeans really like “Judge Judy”. Who knew? Two excursions were included on our Pretoria to Cape Town journey. The first was a stop in Kimberley to tour the famous Big Hole, an historic diamond mine. It was here, in 1888, that the De Beers Diamond Company was formed through a partnership between prospector Barney Barnato and Cecil Rhodes. Rhodes is a central and inflammatory character in the history of South Africa and the tour provided some introductory information about him. For example, he was sent to Africa at the age of 17 to pursue business opportunities because his family believed the climate would improve his weak respiratory system. 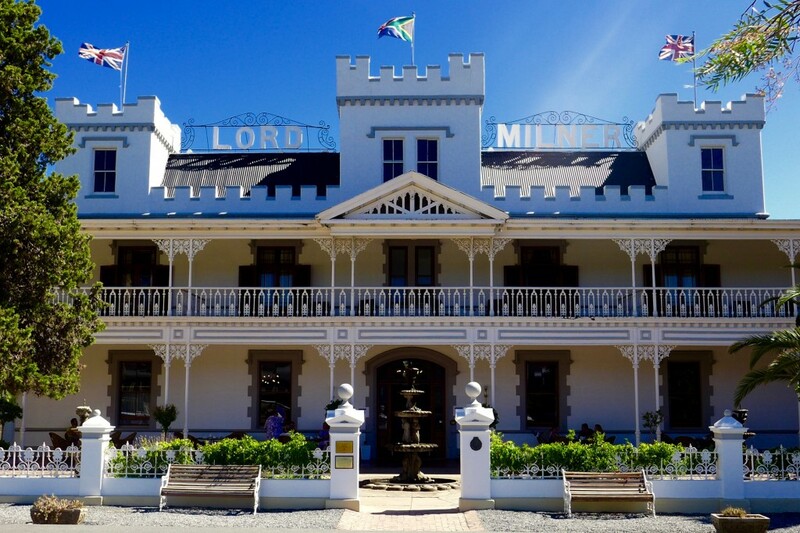 The train also stopped in Matjiesfontein, a tiny, well-preserved Victorian village featuring the picturesque Lord Milner Hotel and several small museums with displays of antique cars and cameras. It was a good chance to stretch my legs and get some steps; my only other exercise was pacing between the train cars waiting for the gong. Pulling into the Cape Town station, I got my first glimpse of Table Mountain with its famous cloud “tablecloth”. The train staff gathered our luggage and the backseat drivers gathered for a final cocktail and goodbyes. Swinging down from 1894 onto the platform, I was nearly mowed down by someone racing along, staring at their cell phone. Welcome back to the present. I’m trying to solve the mystery of why luxury train travel became extinct. Is it simply because we’re all in a great hurry to get somewhere? After riding Rovos Rail, I think we’d be better off taking the long way. You get to relax and enjoy the ride. Noise – I’m easily awakened by noise when sleeping. I blame it on years of listening for babies’ cries and teenagers’ cars. I actually found the motion of the train quite relaxing and was able to fall quickly back asleep after waking up. Perhaps the wine at dinner helped? If you’re worried, though, bring earplugs. Food – Lunch and dinner are set menus, but, according to company representative Alicia Taljaard, “Our chefs are always ready to prepare an alternative meal if requested and there is always a vegetarian option available too.” When I saw ostrich as the main, I’ll admit I was hesitant. But a lovely woman across the aisle advised me to “Eat with your mouth, not with your head.” and I’m glad I played along. It was delicious. If you have dietary restrictions or allergies, definitely let the staff know well in advance of your journey. They’ll confirm with you prior to boarding. Another food tip? When they offer the second lobster tail, take it. Clothes – I have to admit I wasted hours worrying about what I’d wear on the trip. Rovos guidelines suggest smart casual for day and more formal attire for evenings. Due to transfers I was making, I was limited to a duffel bag for luggage, which meant that ballgowns were out of the question. I settled on skorts with bright-colored tees for day and jersey knit dresses for evening, accessorized with a necklace and sandals. I was perfectly comfortable, Goldilocks-style – neither under- nor over-dressed, but just right. Halleluia, though, for the couples who pulled out all the stops. An Irish bride appeared on the second night in a cream tulle skirt with a cropped silk tank; she was breathtaking. I also adored the florid gentlemen in their snug tuxedos. Electronics – Rovos wants to create a sophisticated atmosphere for its passengers and they politely request that guests restrict the use of electronics to their private cabins. It was refreshing to see grownups immersed in paperbacks, playing cards, and engaging in conversation. I enjoyed it so much, I’m gonna party like it’s 1894 this year and leave my phone at home when I go out with friends. There were two young men on the trip who refused to comply with the guidelines: they wore cargo shorts and concert tees to dinner and only looked up from their iPads long enough to complain about the food. 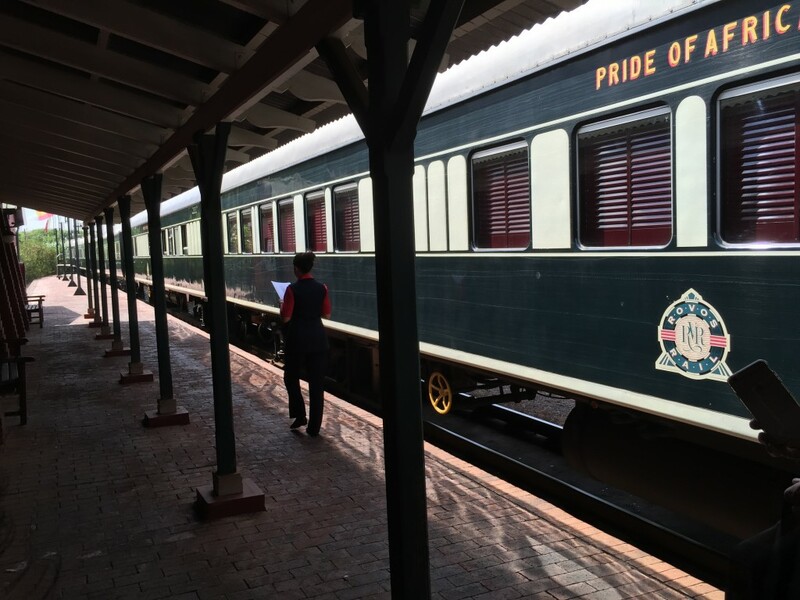 The Rovos Rail train trip offers guests a luxurious occasion to pretend you’re a Downton dowager for a couple of days. If you don’t want to play along, stay home. Heavenly! It’s the post I’ve been waiting for! You would be a custom fit for this journey, Chris. Pencil it in for your future travel plans. Oh my — it just sounds terrific! Add some glamping and I’m in!! Glamping will be addressed in a subsequent installment, Anne. Stay tuned! Wow, what an experience. It sounds fantastic. Brilliantly written, OS. Thank you, Connie. It was a wonderful trip. “Eat with your mouth, not with your head” – great advice! This is a new bucket-lister for me! Thanks!! Just beautiful. Love riding the rails. Right? Let’s hear one of the US presidential candidates talk about elevating Amtrak – I’d love to tour America this way!